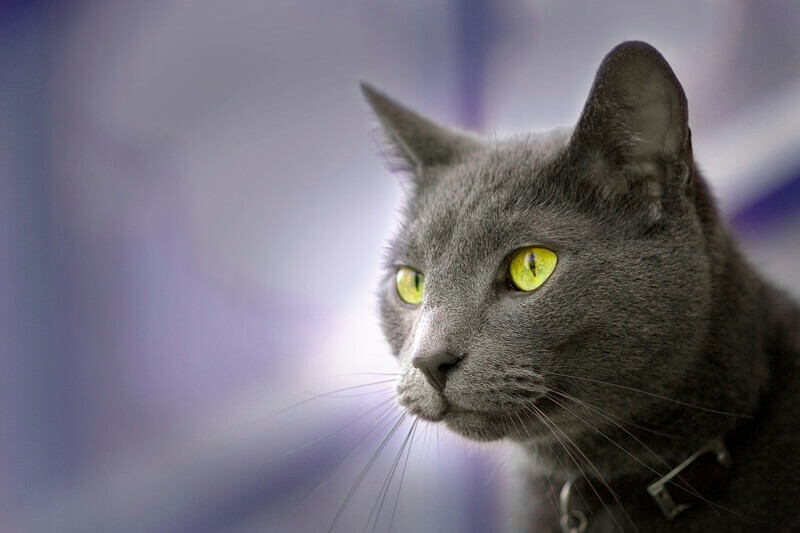 With their shimmery blue coats, striking emerald eyes, and possible ties to Russian czars, Russian Blue cats can’t help but have a certain air of elegance. However, if you’ve spent time with one of these gorgeous kitties, you know that they’re as sensitive and caring as they come – and clever, too! In fact, the more you learn about Russian Blues, the more there is to love. Russian Blue cats belong to the same classification as the British Blue Cat, the Chartreux of France, and the Korat of Thailand. However, they are a distinct breed with unique characteristics. Russian Blues stand out because of their bright green eyes. They are also slenderer in build with a wedge-shaped head, while their blue cousins tend to be stockier and rounder in the face. Russian Blue cats grow to be approximately 10 inches tall and weigh 7-15 pounds. If well cared for, they can live 15-20 years – if not longer! These kitties are also referred to as Archangel Blues, Foreign Blues, or Maltese Cats. The Russian Blue Cat is a naturally occurring breed, which means we’ll never know its true origin. However, they likely originated somewhere in northwest Russia. One theory is that these sleek kitties descended from the esteemed pets of the Russian czars. 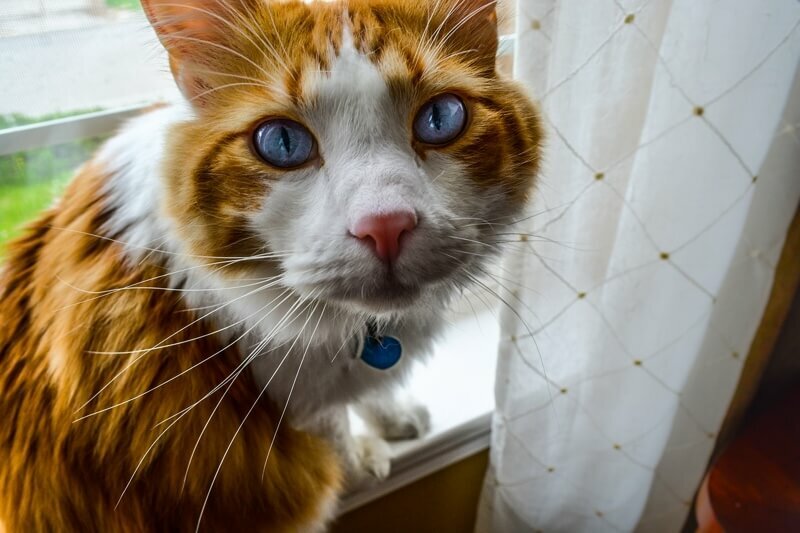 Sadly, others speculate that the first Russian Blues lived in the wilderness and were hunted for their prized pelts – such thick, dense fur with unique coloring would have brought in the big rubles. In any case, it is believed that Russian sailors befriended the felines sometime around the 1860s and brought them aboard their ships as companions, most notably in the bustling port city of Arkhangelsk. 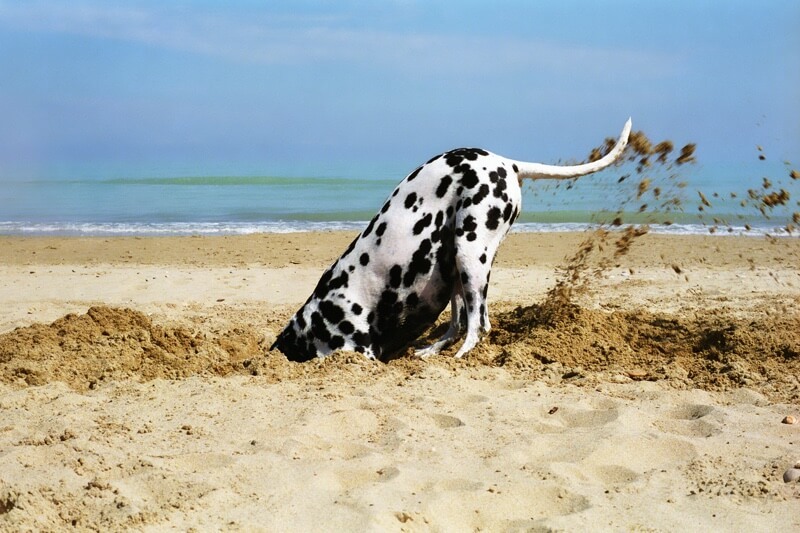 This could explain how the breed came to Great Britain and Northern Europe. Arkhangelsk translates to “Archangel,” which is also why Russian Blue cats are sometimes called Archangel Blues. Once Russian Blue cats made it to Great Britain, the breed took the cat world by storm. In 1875, Russian Blues were shown at one of the world’s first cat shows held at London’s Crystal Palace. They didn’t win any prizes but left quite an impression – mainly that they were incredibly handsome. In 1912, around the same time Russian Blues were making their way to the U.S., they were officially recognized as a breed. After World War II, Russian Blues were in decline, but enthusiasts managed to save the bloodline. In Sweden, Finland, and Denmark, they crossbred Russian Blues with Siamese cats to produce slightly longer and more angular kitties. In Great Britain, they crossbred with Bluepoint Siamese and British Blues for thicker, stockier cats. However, the Russian Blues we know and love today more closely resemble the original breed. We call them blue, but Russian Blue cats actually come in a range of bluish grays, anywhere from a light silver to a deep slate. Regardless of shade, their vivid green eyes and pinkish paws are perfect accents. Although they are shorthaired, Russian Blues have a very dense double-layered coat. Their undercoat is soft and downy, while the outer layer is even-colored with silver tips. This accounts for the breed’s alluring shimmer. Although I’ve personally never tried it, they say that the Russian Blue Cat’s fur is so thick and velvety that you can trace patterns in it with your finger, and the designs will remain until you smooth them over again. In terms of build, Russian Blues are lean and fine-boned but muscular. They have a triangular head with pointed ears and wide, round eyes that give them a friendly, curious expression. Russian Blue cats have thick coats, but they shed very little. 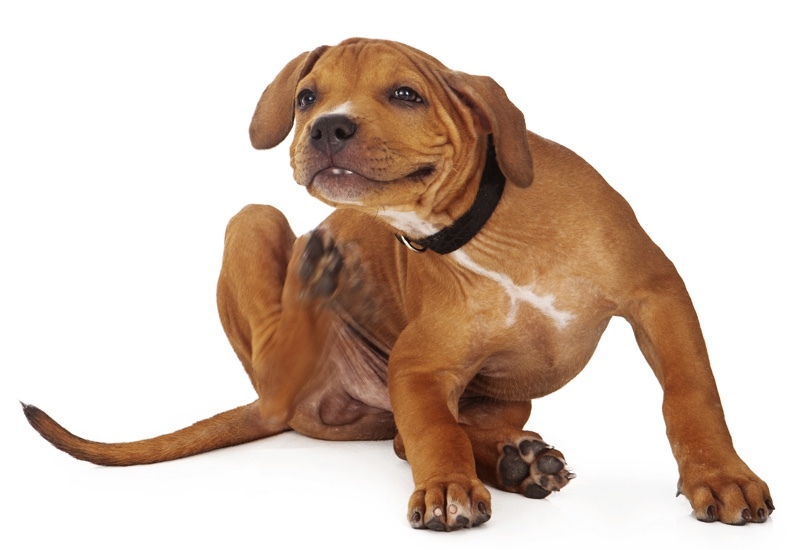 Brush or comb your pal once or twice a week to remove excess hair and help distribute their natural skin oils. You may want to increase brushing during the spring shedding season. Otherwise, just keep up with basic grooming needs like trimming your kitty’s nails as needed and brushing their teeth with a veterinarian-approved pet toothpaste. Russian Blue cats are notoriously fussy in terms of cleanliness and routine. 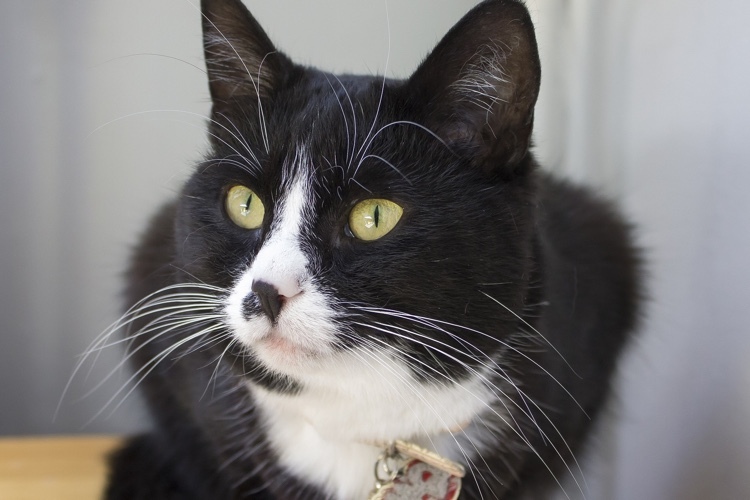 Keep your feline friend’s litter box spotless, or they may revert to finding a bathroom location they deem cleaner. It’s best to establish – and stick to – set mealtimes, as well as a time devoted to play. (Hint: they love playing fetch!) They are also excellent climbers and explorers, so you may need to install childproof locks on cabinet doors and block any small spaces that could be dangerous. Otherwise, these independent kitties are fine to stay at home alone for long hours while you work. Russian Blue cats make great companions for first-time pet parents, working singles, and families with older children. 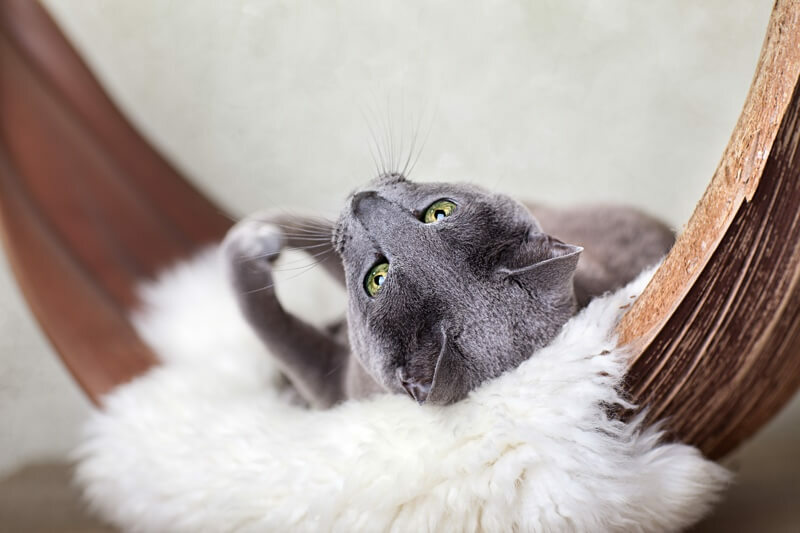 Are Russian Blue Cats Really Hypoallergenic? 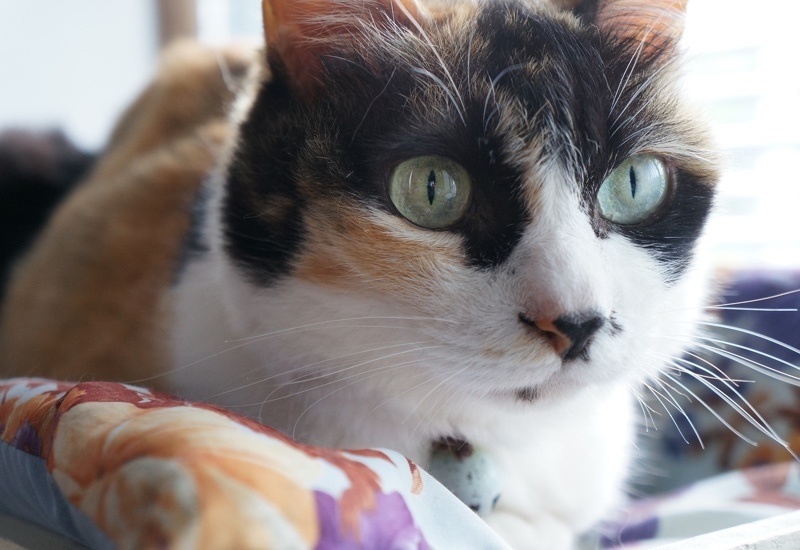 Are you’re pining for your own adorable furry friend but are usually left sneezing after cat encounters? Then you may have already heard the myth that Russian Blue cats are hypoallergenic. Is it true? Yes and no. It is true that Russian Blue cats have lower levels of Fel d 1, the protein in cat saliva and skin secretions responsible for your itching and wheezing. However, even small amounts of Fel d 1 can cause allergic reactions. Russian Blues also produce dander, which irritates allergies. 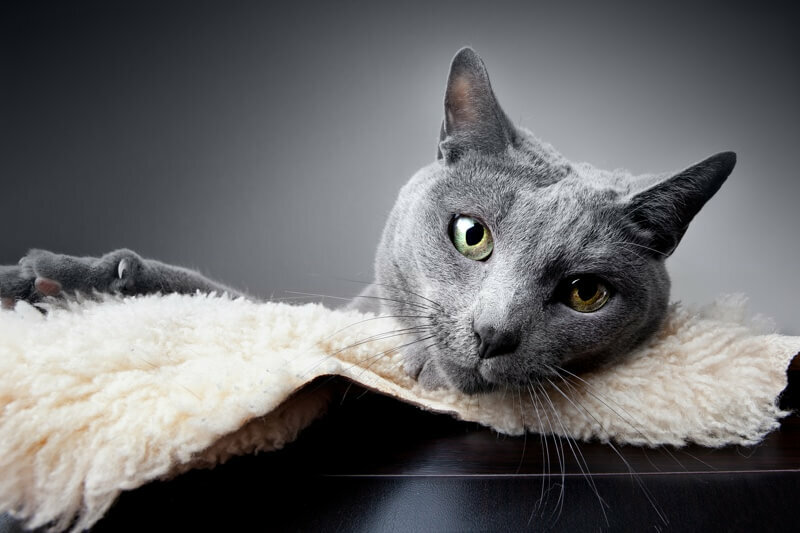 Russian Blue cats are curious but calm, affectionate but not clingy, and very smart. They can be shy at first, but they are playful and loving once they feel comfortable. 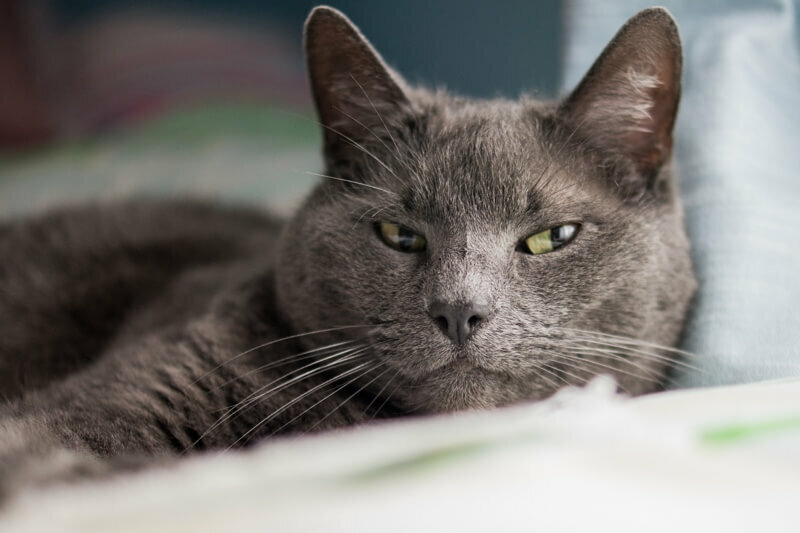 While they are happy living with families and even other pets, Russian Blue cats tend to form a deep connection with only one person. Once they bond with someone, they will be very sensitive to their pet parent’s emotions – if you’re sad, don’t be surprised if your Russian Blue pats your face to cheer you up! As a naturally occurring breed, Russian Blue cats are also naturally very healthy. Aside from a slight increase in the risk of bladder stones and urinary tract issues, the only real concern is obesity. Russian Blues love food – and they will always ask for more. 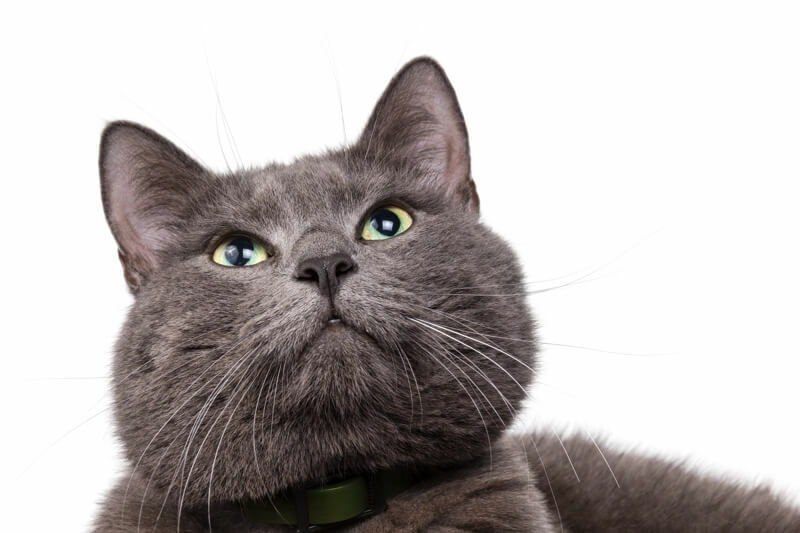 If you have a Russian Blue Cat, you might want to measure their food portions and speak with your veterinarian about the right nutrition plan for your kitty. An ASPCA Pet Health Insurance plan can help cover the costs of diagnosing and treating all sorts of health conditions like these. 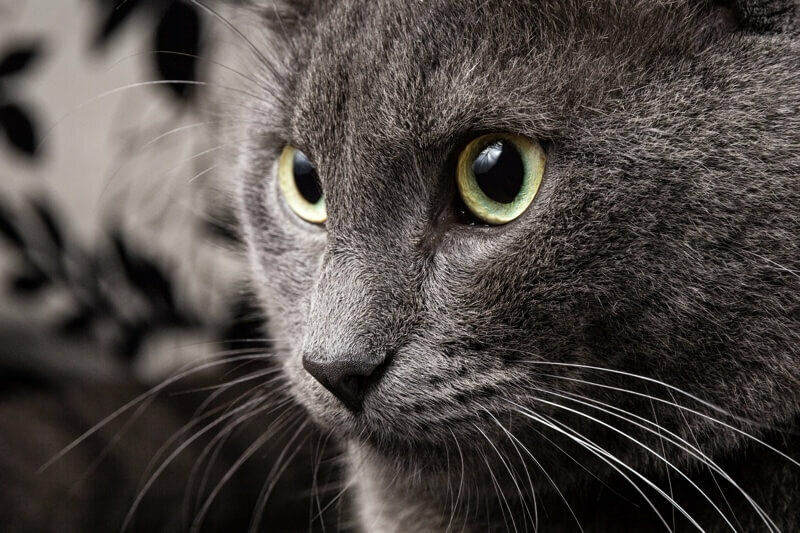 If you have a Russian Blue or are thinking about adopting one, you should consider coverage for your furry family member. Learn more by getting a quote now. Russian Blue cats have a slightly upturned mouth, giving them subtle smile similar to Mona Lisa’s famous smile. According to folklore, Russian Blues were kept in the chambers of newborns to chase away evil spirits. In the Warner Bros hit movie Cats & Dogs, a Russian Blue cat is featured as a trained assassin. Russian Blues are blue because of a diluted gene. The gene responsible for their blue-gray coloring is actually a form of the black-hair gene. Internet sensation Nyan Cat, the half-cat, half-Pop-Tart animated meme is based on the illustrator’s Russian Blue, Marty. Fans of the famous Tom and Jerry cartoon speculate that Tom, with his bright green eyes and blue-gray hue, is a Russian Blue. Some Russian Blues are born with “ghost stripes.” These are faint tabby markings that disappear as the kitties mature. If you’re adopting a Russian Blue Cat, you’ll want the perfect name for your pretty kitty. You could go with Blueberry, Bluebell, or Blue Moon. If you want to pay homage to your furry friend’s roots, try Ruble, Kroshka (“Baby”), or Krasavitsa (“Beautiful”). Here some more suggestions based on famous Russian writers, composers, and dancers… with a Harry Potter reference thrown in for laughs!